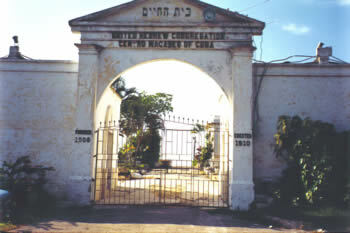 Gate of the Guanabacoa Jewish Cemetery outside Havana. Consecrated in 1910 after four years of planning and seeking permits. On 5 August 1906 eleven English-speaking Jews held a formal meeting in Havana with the intention of founding a congregation and cemetery. The venue was the home of Manuel Hadida at Pasaje Arcado No. 9. Hadida was a Sephardic Jew originally from Algeria, who apparently had migrated from North Africa to Paris, and then to the United States. Evidently it was from the United States that he moved to Havana. Typical of the period, most of the others were Ashkenazi "Americans," although some had been born in Europe. At this meeting, the eleven men declared their intention to create a congregation for the more than one hundred "hebrew (sic without capital letter) settlers" on the island, and to purchase land to be used as a cemetery "after its solemn dedication according to Jewish rites." (The spelling errors in the Minutes are another indication of non-American origin of the recording secretary.) This community would presumably include the Jews of Havana, Matanzas, Camagüey, and the Island of Pines (more recently Isle of Pines, then renamed Isla de la Juventud [Isle of Youth]). Although these cities are mentioned in the minute book, written records of Jewish settlement from this period are to be found only regarding Havana. Mention of the estimated number and general location of other Jews outside Havana also suggests that there had been contact amongst the Jews in Cuba; however no known records are extant. The group formed what became United Hebrew Congregation (UHC), somewhat of a Jewish "home away from home." Their emotional "home" was the United States, not Cuba. Jewish heritage was a cohesive bind. None in the group was punctiliously observant of religious dictates. Conversing in English in an atmosphere that was Spanish-speaking united them. These Jews were also financially successful. (Subsequently, when Joseph Steinberg encountered financial difficulty, he felt out of place and ceased to be active in the group.) Thus, later when immigrant Jews started to arrive from Turkey, the newcomers were not welcomed. These turcos were of a different Jewish culture. They were not English speakers. They were not businessmen. Nor were they well-to-do. In the Guanabacoa Cemetery a memorial to Holocaust victims. The monument notes that human soap is buried here. It was not until 1903 that the Colόn Cemetery was finished. According to protocols, all buried remains were to have been exhumed from other Havana cemeteries and reburied in Colόn. The land of the other cemeteries was then redeveloped. Consecrating a separate Jewish cemetery was not a simple affair. Although there was official separation of church and state in post-Spanish Cuba, the Roman Catholic Church still held a monopoly regarding death and burial. Other minorities, such as the Chinese, benefited from intervention by their respective governments when their interests were involved. Jews, however, had no such address. Thus, Jewish Americans in Cuba chose to capitalize on their American rather than Jewish identification; they sought intervention by the United States Government. The Americans, of course, had special influence given their general position on the island. At the first meeting Louis Jurick was elected chairman of the Hebrew Congregation of Cuba, and Manuel Hadida was chosen as general secretary. On 19 August 1906 the name of the group was changed to United Hebrew Congregation (UHC) of Cuba, and Robert Diamond was elected treasurer. The pressing need for a Jewish cemetery was unfortunately highlighted a month later when Diamond passed away suddenly. Joseph Steinberg was appointed the new treasurer. As efforts were made to establish a Jewish cemetery, burial continued to be a very difficult problem needing recurrent attention. A note dated 26 November 1908 in the UHC minute book states that the previous day A.M. Edelweiss had passed away. On the day of the note he was buried in the Roman Catholic Colόn Cemetery. In accordance with Jewish Law, the body was not embalmed. The person entering the note in the minute book added, "When our Cemetery will be in shape to receive the dead, we are duty bound to remove the remains of Brother A[lberto].M. Edelweiss, [and rebury him] where he belongs." This, however, was never done. The Russian-born Endweiss was buried in a paupers' section of Colόn Cemetery (NE 7), which was redeveloped, probably in the 1920s. Nothing remained of the grave. Cemetery records show no mention that the body was ever exhumed and interred elsewhere. Edelweiss was never a member of UHC. He was poor. He was Russian with no American connection. He did not fit into the UHC crowd. The moving of remains was possible. That is exactly what was done with the body of Mrs. J.H. Heller Sufter. On 19 July 1913 her remains were reburied in a publicized ceremony in the Guanabacoa Jewish cemetery, after they were exhumed from previous interment in "Colόn." 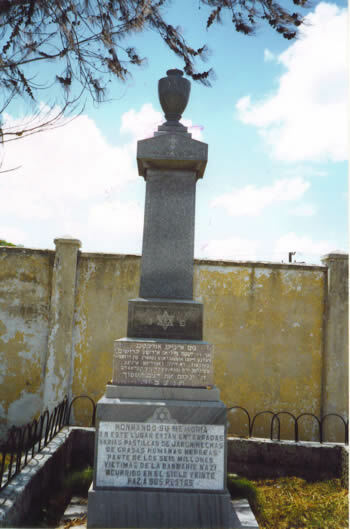 In seeking Cuban permission for a Jewish cemetery, Manuel Hadida took a leading rôle in interfacing with the U.S. Government. After all, it was the United States that had the strongest influence on Cuba. On 7 October 1906 Hadida reported that he had met with Rabbi Haim (Henry) Pereira Méndez (13 April 1852 - 21 October 1937), spiritual leader of the Spanish-Portuguese synagogue, Shearith Israel, in New York. Méndez recommended that Hadida consult with Adolphus Simeon Solomons (26 October 1826 18 March 1910) of Washington, D.C., who had influence with the State Department. Solomons was not a newcomer to the United States; he was a Sephardic Jew, born in New York to John Solomons, who had made his way to the United States in 1810. Solomons was an influential Washingtonian with strong White House and Congressional connections. In 1851 Secretary of State Daniel Webster (1782-1852; Secretary of State, 1841-1843, 1850-1852) appointed Solomons as "special bearer of dispatches to Berlin." President Ulysses S. Grant (1822-1885; President, 1869-1877) offered Solomons the position of Governor of the District of Colombia (which Solomons declined). Solomons did not shun his Jewish affiliation. On 12 February 1883 the United States State Department sought Solomons' advice and assistance regarding the distribution of charity funds to Americans in Ottoman Palestine. Not only was Solomons active in political circles. He was active in Jewish circles as well. Solomons was acting president of the Jewish Theological Seminary (JTS) when the institution was reorganized in 1902. The Jewish Theological Seminary in New York played an important supporting rôle for United Hebrew Congregation. Solomon Schechter (1847-1915), a renowned JTS president and faculty member, had three family members in Havana's United Hebrew Congregation. Even before Solomon Schechter joined the faculty of JTS, he was a guest in the Washington, D.C. house of Adolphus Solomons. Thus, JTS was a link between Schechter and Solomons. The two also knew Rabbi Pereira Méndez quite well. Pereira Méndez had also been active in JTS. In 1910 it was, in fact, Rabbi Pereira Méndez who officiated at Solomons' funeral. The UHC-JTS cooperation did not end with the issue of the cemetery. The Schechter-JTS connection helped collect funds needed by UHC to aid World War I refugees in Cuba. The connection, however, came to an end as time passed. The last overt indication of close cooperation was in 1923, when UHC hired a JTS student as rabbi for the High Holidays. This marked the end of an era. The working relationship had been both personal and somewhat ideological. New power groups were taking over in both JTS and UHC. In Havana the old guard of Eastern Europeans immigrants to the United States comfortable with traditional ceremonies was being replaced with Americans to whom Reform Judaism spoke their native language  English. The 1923 hiring of the rabbi was the last public connection between the two institutions. UHC was on its way to becoming the Reform congregation of Cuba. Although UHC had a working relationship with JTS, the synagogue was by no way Conservative by conviction. It was an association of convenience, not philosophy. Presumably it was through Solomons that Hadida succeeded in having an order sent to the United States Minister in Cuba, with instruction to help the congregation obtain the necessary permit to acquire land for a cemetery; this was reported at the fifth meeting of the United Hebrew Congregation leaders. At the eighth meeting of United Hebrew Congregation, Hadida announced that the Cuban government had granted a permit for the cemetery. On that same evening, Hadida began soliciting subscriptions for gravesites so that they could go ahead with the purchase of the land. The cemetery, consecrated in 1910, is in Guanabacoa, a neighborhood across the bay from Habana Vieja. First settled by Europeans in the 16th century, Guanabacoa was a poor area, until wealthy residents moved in during the 1920s and 1930s.